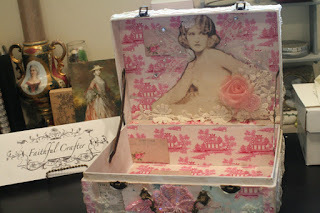 I had a wonderful opportunity to be a guest designer for the Crafty Me Shop on Facebook. There is a video at my YouTube channel that shows all the gorgeous French laces and trims that were sent to me to make what ever I wanted. I choose to do an altered suitcase that will store all my vintage photography and postcard collection. Tilda papers where used on the inside and outside of the box. 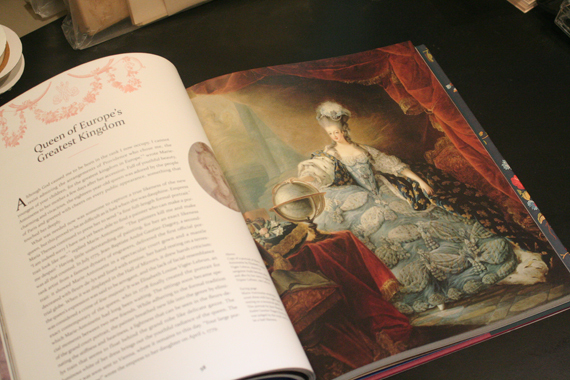 An image of Countess Henrietta Vernon painted by Thomas Gainsborough in 1767 is featured on the front. Laces were trimmed to create a cameo around the portrait. 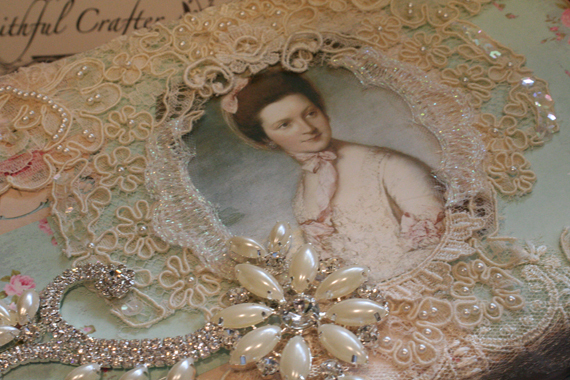 A large jeweled trim of rhinestones and pearls accents the French lace across the front. 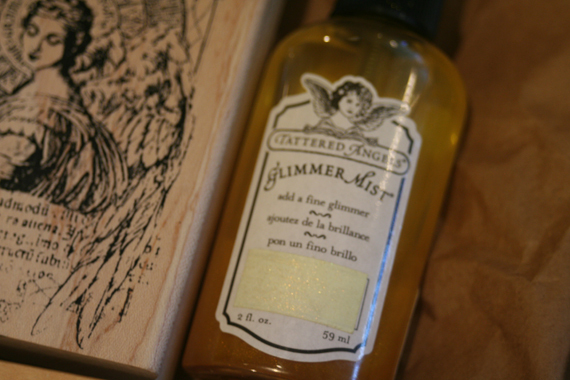 The inside of the box has the Tilda paper as well. 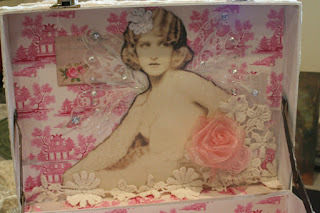 The sepia photograph was printed on fabric and I fussy cut the lady to fit inside the lid. Butterfly wings were glued behind her to add whimsy and depth. More French lace runs across the bottom and up the side. Visit my YouTube channel at FaithfulCrafter1 to see the entire video explaining the project. I was asked to design some recipe cards for a bridal shower that had some vintage style to them and a little French country feel. 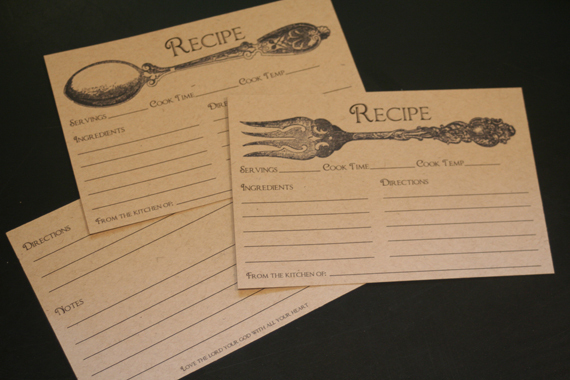 The cards need to fit inside a recipe box the client ordered and wanted 4" x 6" cards and dividers. I selected a French Speckletone 80# cover cardstock in Oatmeal color and used black text and ink for the hand-stamped images. Came up with a couple of designs using different fonts and she like this one. The fork & spoon and rose images are two different looks. I have another Jane Austin that is coming out soon. 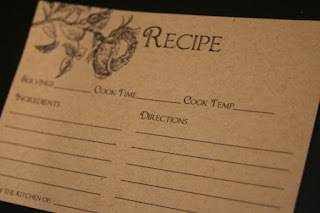 These can be printed on white, cream of the French Speckletone...which is my favorite paper right now. 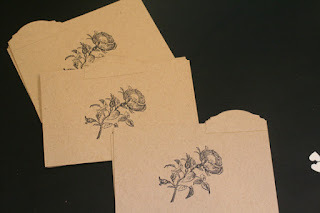 The client selected the rose patterned cards as the recipe box had a rose on it as well and would coordinate nicely. She wanted matching dividers of I came up with these. Used a lovely Spellbinder die for the tab piece and mounted some on the left, center, and right with a rose image stamped in the center. Packaged them all up and off they go to a happy customer! And as in most of my designs, there is scripture on the back that reads Love the LORD with all your heart. So far, I really like the way this journal design is evolving. 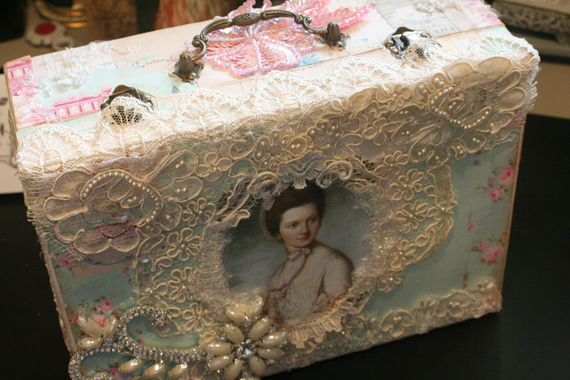 I've had a chance to play with some of my favorite stamps, embossing pastes, laces, and artwork to pull together the covering for my latest project. The cover art piece is a painting by Thomas Gainsborough, one of my two favorite artist, Reynolds being the other. This portrait is of Countess Mary Howe painted in 1763. There is a brilliance in how her costume has been painted. Wearing a lightweight summer dress of pink silk overlain by an apron of lace and layers of lace on the arms. Her pearl necklace is stunning and set off her delicate face. I used different laces and small pearls to compliment the artwork and bring out in a tactile way, those elements across the cover. The use of mulberry paper flowers, stained, and brushed in clear gold glitter adds a richness that would be expected by Countess Howe if this were her book. I added a vintage gold and rhinestone crown to add some metal detail to the design. I feel challenged to add at least one piece of vintage jewelry (a passion of mine) to each item I design. The books spine was a particular design effort as it is 2 1/2" wide and 9" in length and I wanted the book to be able to stand up on a shelve if that is the way I wanted to display it. So the spine needed extra strength and attention. 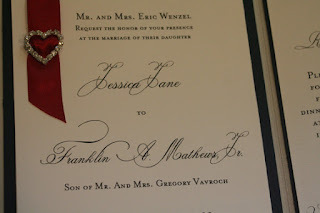 I used extra-heavy weight cardboard stock, then ran it through a damask embossing folder to create the relief. Painted it with Silks acrylic glaze which added tons of shine. Wanted the look of rich oiled leather. 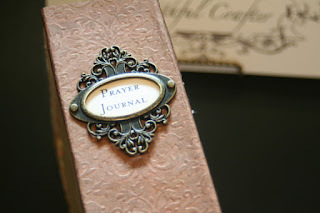 Added the vintage style old gold metal plate and title paper Prayer Journal. Added a metal element of a key plate after dying with gold ink as it was copper color. Put a title banner across the front Oh Lord, hear my prayers. 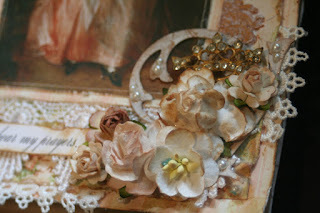 You can watch the step-by-step mixed media tutorial of this whole process on my YouTube channel faithfulcrafter1. If you like this type of tutorial, please like, comment, and subscribe. 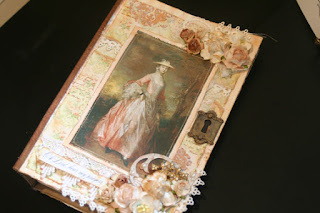 Creating a mixed media junk journal using scraps from my shop. 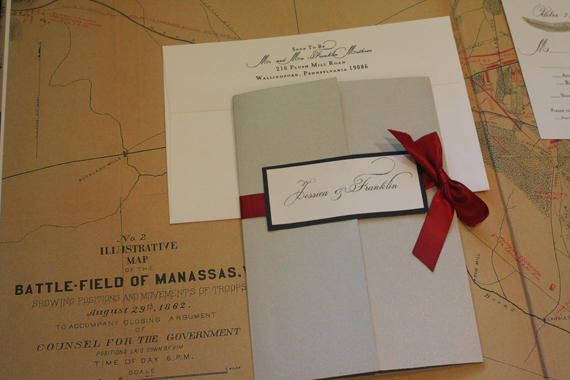 Part I shows the construction of the cover, book binding, and inside pages. This book is going to be a prayer journal. 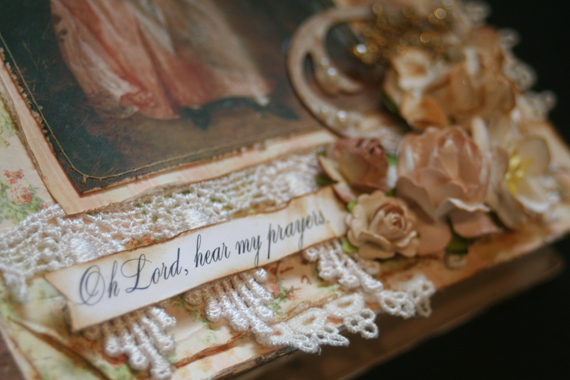 It will have areas for pics of family, journaling sections to keep track of prayer requests, praise reports, areas for scripture memory work, Bible study plans, as well as thoughts and reflections section. 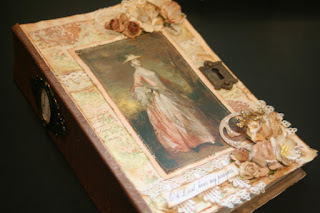 Design theme will be vintage 18th Century, French and English influences, with a touch of shabby chic! Working right now on video showing the mixed media tutorial of designing the cover, spine, and back panels. Wishing everyone a Happy and Blessed New Year! 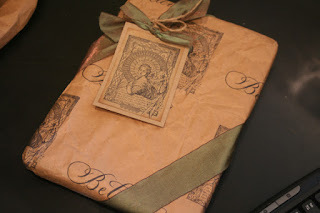 With upcycling and repurposing a focus right now for crafters, I played with designing gift wrapping paper and matching tags using scrap Kraft packing paper from my shop. 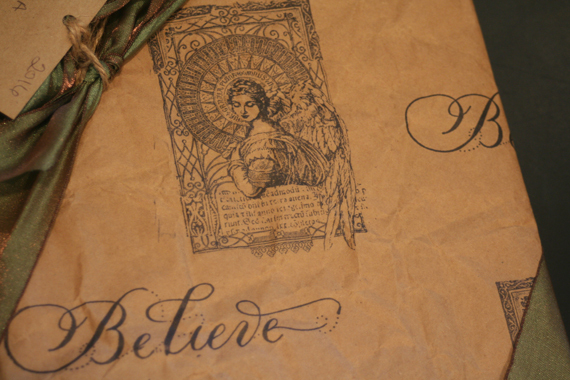 Smoothing out the packing paper, I then randomly hand-stamped the vintage angel and Believe images using Ranger Archival Ink in black. 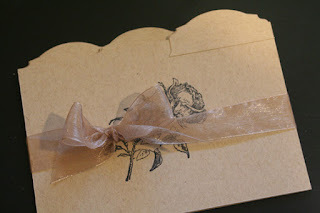 The tag uses matching scrap Kraft cardstock as a base sheet, then topped with a second sheet of the hand-stamped image of the angel. 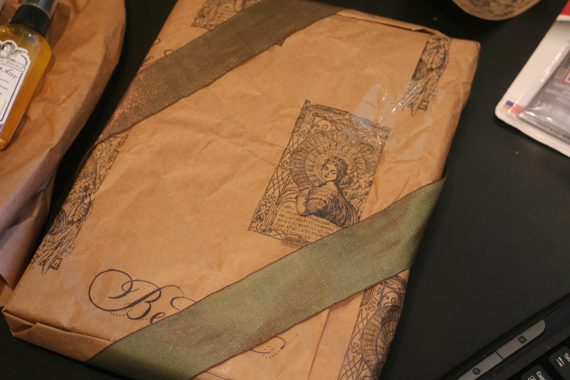 The tag has jute twine secured at the top with tails and also a scrap piece of matching green ribbon knotted with tails. I distressed the edges of the top sheet with Vintage Photo ink and then sprayed the image using Tattered Angels glimmer mist in a light gold color. The repeated pattern carries across the entire sheet of paper, so even the back is decorated. 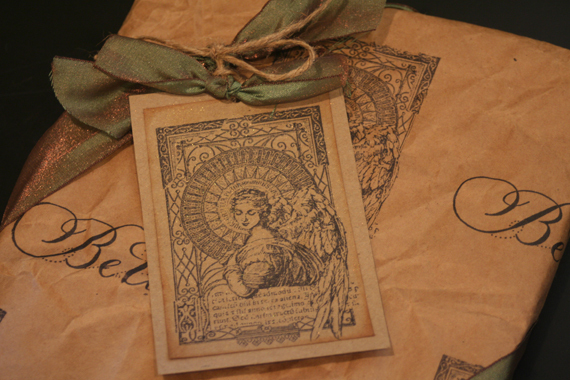 The crinkled Kraft packing paper lends an aged effect to this hand-made vintage shabby chic style of packaging. Thanks for stopping by and leave a comment. 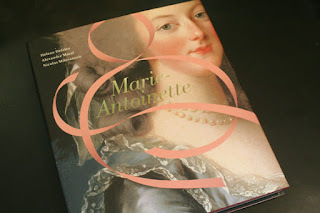 Just received my new book Marie Antoinette. I found it while touring France and visiting the Palace of Versailles. This is a beautifully designed book and covers the life of the ill-fated queen, her husband, and children. 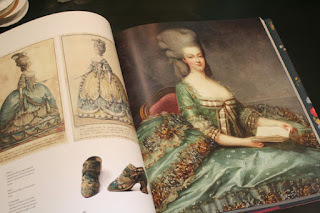 It begins with her life at the Viennese Court, then marriage to the King, court life at Versailles including Petit Trianon. The book finishes with her down-fall, the revolution, and tragic end. 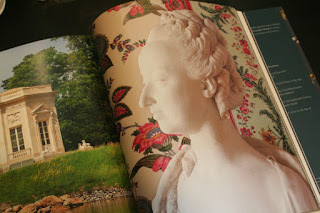 Petit Trianon-The Queen's Refuge is also covered very well, showing the buildings, clothing and lifestyle while the queen was there. 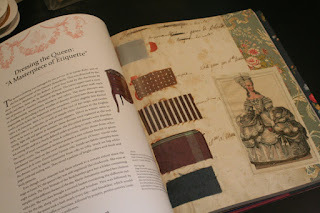 Sincerely appreciate the level of details the book offers regarding Dressing The Queen as well as her furnishings and room décor at the palace. The photography and details are gorgeous throughout and is a must-have for those interested in life and times of Marie Antoinette. and they wanted a blue and grey themed set. an official proclamation document from the desk of either Grant or Lee! 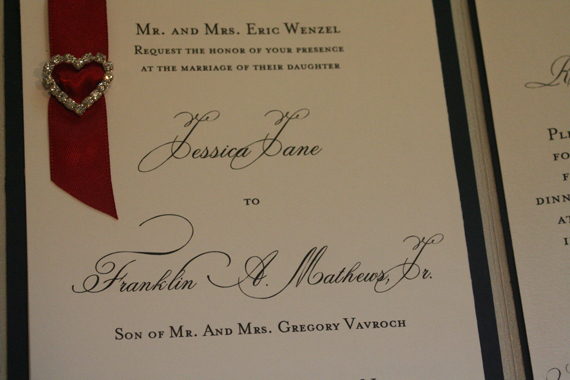 The red satin ribbon and rhinestone heart appears to have a official proclamation to the main invitation. 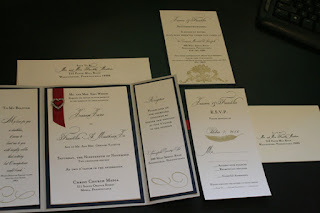 Metallic silver cardstock base, with navy blue second sheets present the white top sheets. 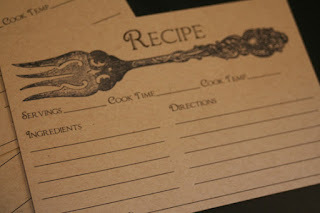 Elegant fonts are used to provide a vintage feel overall. 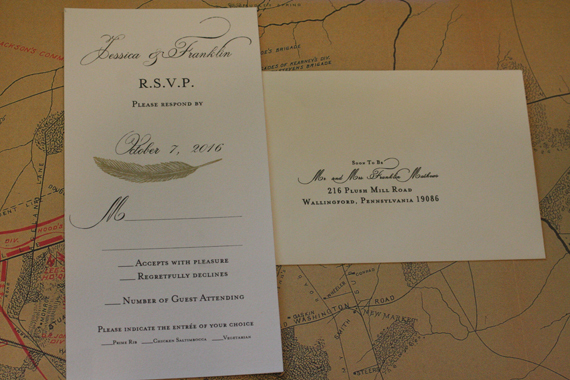 Metallic gold hand-stamped images are an elegant touch to this official proclamation of Love. 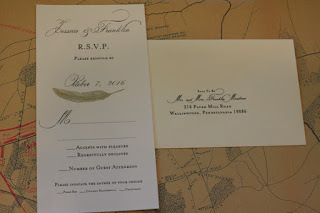 Oversized RSVP card is accompanied by an Monarch size envelope making a statement to your guest. And an oversized Accommodations insert card finished out the package. 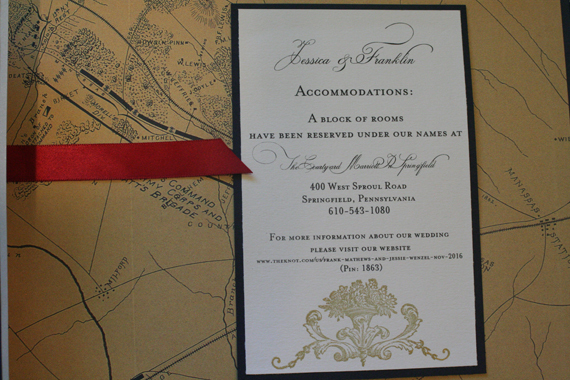 A beautiful North & South Civil War themed wedding invitation suite arrives to the guest neatly wrapped in a red satin bow and tails. This was one of two designs submitted for this client. Design Two will be shown next week. P.S. Scripture panel on the back of the invitation is 1 Corinthians 13:13, And now these three remain: faith, hope and love. But the greatest of these is LOVE. Hello, my name is Valerie. 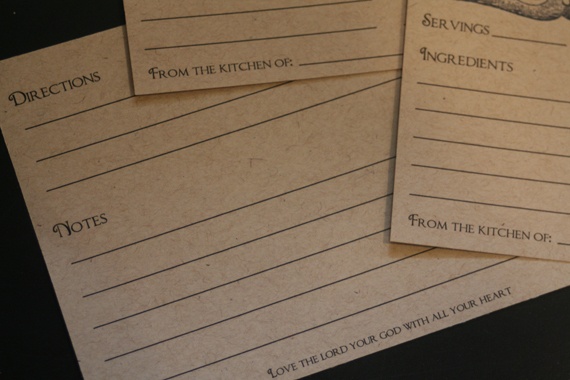 I enjoy making hand-made Christian gifts and stationery. 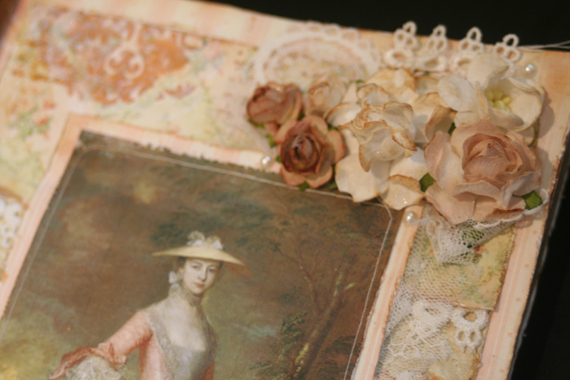 Love to play with papers, rubber stamps, paints, inks, fibers, well...just about all crafting mediums to recreate a vintage European style in all my pieces. Feel blessed to be able to share my Christian faith through my designs. Live on Running Waters Farm with my "better half" husband Bill, our horses, cats, goats, and chickens. I'm a wine-maker, gardener, food preserver, wife, mother, and Grandma. Whew! Thanks for stopping by. flowers from my Moms Garden! 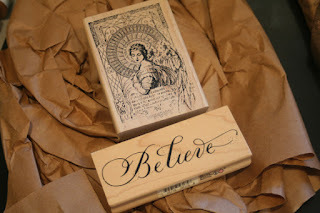 This blog is meant to inspire you, both creatively and spiritually. All artwork, hand-made items, text and photography (unless otherwise credited), are mine . Please do not copy any materials without receiving written permission first. Thank you.